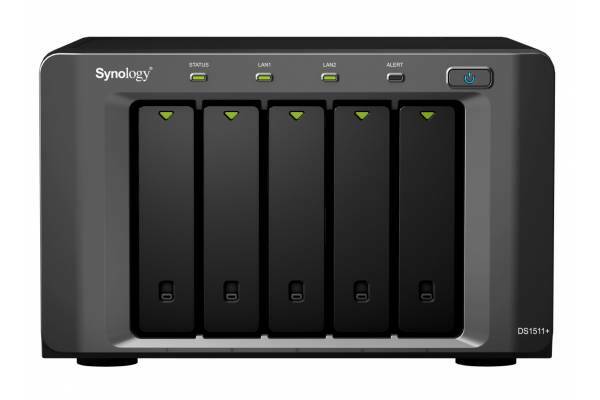 Synology America announced the release of its newest server, the Disk Station DS1511+. Synology America has released its newest network attached server (NAS) solution, the Disk Station DS1511+. This model should appeal to small business, prosumers and network administrators, according to Sam Felsing at Macworld. Expected to retail at under $800, the five-bay DS1511+ is capable of housing 15TB of data and can host two DX510 expansion units for a total of 45TBs of storage. Designed for easy file sharing, scheduled backups, remote access and centralized backup, the DS1511+ can push write speeds of 165.91 Mbps and read speads of 165.91 Mbps, reports The Tech Herald. The DS1511+ runs version 3.0 of Synology's DiskStation Manager. Paul Mah highlights a number of the NAS' key features over at IT Business Edge.